Cowleys Residential Protection Plans - Designed to Give You Peace of Mind. If you don't want to see pests in or around your home, Cowleys Service Plans are the right choice for you. Cowleys Silver Service Plan covers 24 common pests and includes three preventative perimeter treatments in summer, spring, and fall, indoor treatments as needed, and unlimited service calls for covered pests in your plan period. A Cowleys Pest Services technician will inspect and treat the exterior perimeter of your home three times per year in spring, summer, and fall, including eaves, windows, doorways, and all entry points on the first floor of your home. Our preventive treatments ensure your property is protected against many seasonal pests. We will treat the inside of your home as needed for all the pests covered under your plan. If the pests covered under your service return, we'll come back during our normal business hours to re-treat the exterior perimeter of your home at no cost to you. *And Removal of their Nests Attached to a Structure. 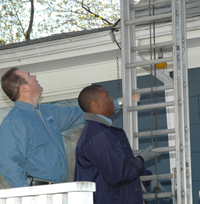 Three scheduled service visits annually and unlimited service visits all year on pests covered under this plan.